While these statements provide interesting information, including specific numbers is what really gets people’s attention, which is where economic indicators come in handy. GDP (gross domestic product) is probably the first economic indicator that comes to mind. Sometimes, it goes along with another indicator, “Real GDP” (real domestic gross product), which usually appears in Time Series Datasets. For example, NOAA Office for Coastal Management’s Economics: National Ocean Watch (ENOW) uses both GDP and “Real GDP in chained (2005) dollars” to depict the Ocean and Great Lakes Economy. So what’s the difference between GDP and Real GDP? And how should we use them? The definition of GDP is the total market value of the final goods and services produced within a country during a given year. In simple terms, “GDP is the yardstick of an economy’s performance.” People are so interested in GDP because it tends to explain a country’s economy in just one number!! This indicator also applies to subnational level (e.g., GDP by states) and industrial level (e.g., GDP by industry), and is widely used for economic descriptions and comparisons in a given year. But GDP, which is also called “Nominal GDP,” is not a very desirable indicator to evaluate economic change over time. That’s because GDP reflects both quantity and price. We all know that prices change over time. Let’s say last year, one dollar could buy two cans of tuna, but this year, only one. 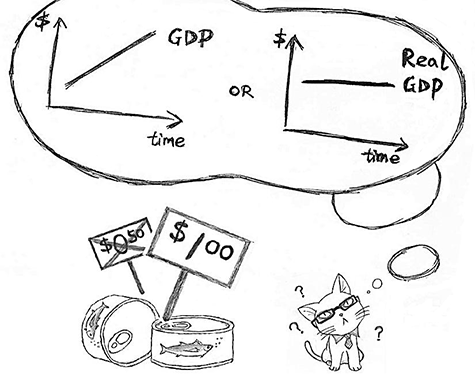 In this case, GDP rise for tuna could be a result of price inflation, not necessarily expanded production. To prevent exaggeration in estimates of economic growth, economists usually use “Real GDP,” which takes the inflation out of GDP figures. Until the mid-1990s, this was done by assessing the value of annual production in terms of base year prices. “Real GDP (2000 dollars),” for example, means that each year’s output is valued at the price levels that existed in the year 2000. When a set of “Real GDP” statistics are calculated by the prices from the same base year, they vary only by quantities and reveal more accurate economic growth. Currently, the U.S. Department of Commerce uses the more complicated chained-dollar method to remove the effects of inflation. This method is able to address anomalies that occur when new products are introduced, when product quality changes over time, and when prices fall because of improved production techniques. The personal computer is the textbook example of this kind of change – introduced in the mid-1980s, with quality increasing and production costs declining dramatically over the next three decades. It doesn’t make sense on any level to account for the value of computers by pricing today’s computers at 1990 price levels. Generally, “Real GDP” statistics are calculated by prices from 2005 and is labeled as “GDP in chained (2005) dollars.” Every year, Bureau of Economic Analysis (BEA) releases four quarterly GDP statistics and annual GDP in both current dollars and chained (2005) dollars. Now let’s take a look at the National Infographic, a summary of the 2009 U.S. 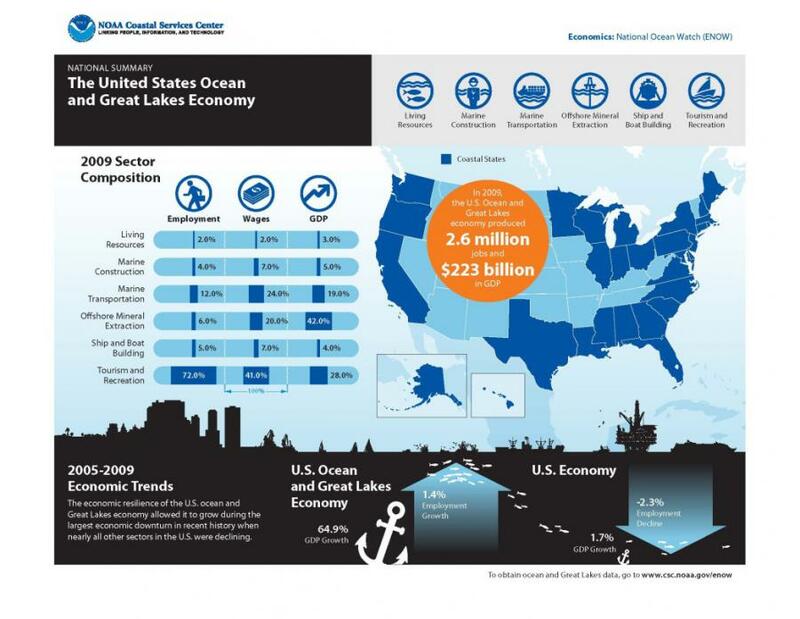 Ocean and Great Lakes Economy using data from ENOW. “Nominal GDP” is used to show the number of billion dollars the U.S. ocean and Great Lakes economy produced. For the part of “2005-2009 Economic Trends,” “Real GDP in chained (2005) dollars” is used to estimate GDP growth without price inflation effect for both U.S. economy and ocean and Great Lakes economy. Of course, no indicator is omnipotent. Indicators should be carefully selected based on the issue you are trying to explain. For example, a growing “Real GDP” does not necessarily mean an improvement of the country’s standard of living. The county’s population may increase more aggressively and people’s average standard of living is actually worse. In that case, “GDP per capita” may be one of the better indicators.